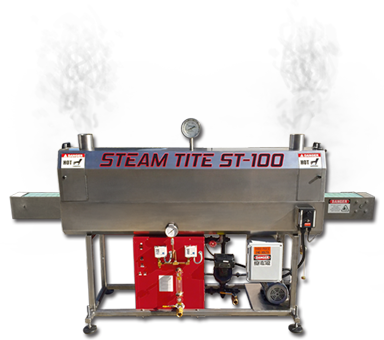 The Steam Tite ST-100 Steam Shrink Tunnel can be used on any shape container to heat, shrink, and conform plastic label sleeves without creating bubble marks or scaring the package. 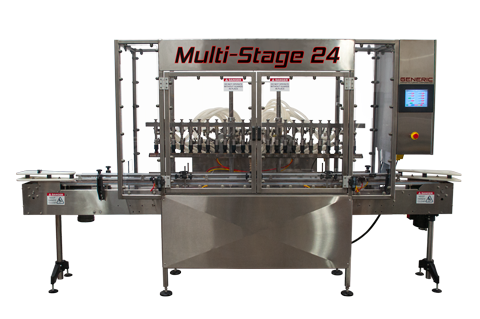 This machine is made right here in the USA, sporting an all stainless steel construction. The unique design of cross vented dual zone chambers supplies an even heat transfer to provide the perfect shrink. 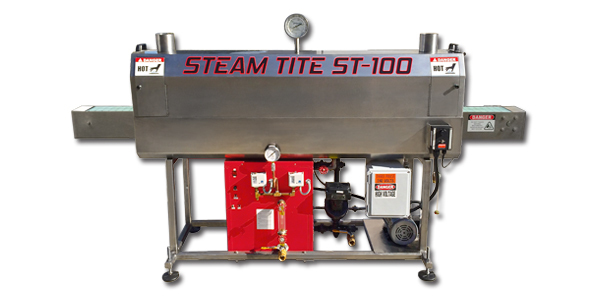 The Generic Manufacturing ST-100 Self Contained Steam Shrink Tunnel is the first of its kind, and has been available since 1995. Though it has been available for quite some time, we have continued to improve its design, and can honestly claim that we offer the best, most reliable steam tunnel on the market today. We have used this machine on a huge variety of different applications such as protein powder label shrinking on large containers, vitamin and supplement bottle label contouring, shaping and shrinking clear plastic sleeves onto oddly shaped hair product containers, steam shrinking nail polish wrapper labels, steam heat shrinking packaging onto health and beauty products, label conforming PVC wraps onto consumer products, and a large number of other applications. 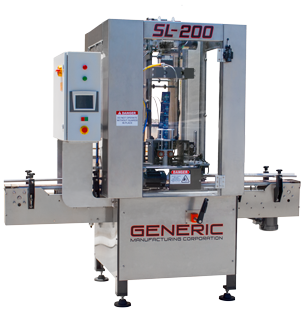 We are proud to say that the Generic Manufacturing ST-100 Steam Shrink Tunnel Machine is currently shrinking labels made from a variety of materials and plastics including PVC – Polyvinyl Chloride (PVC) which is the most commonly used shrink sleeve on the market, The nice clear and strong shrink labels made from PETG HS-LV – Polypropylene Terephthalate Glycol (PETG), the softer feeling steam shrink labels made from OPS – Oriented Polystyrene (OPS), the very scuff resistant labels made from Polyethylene Terephthalate Glycol-modified (PETG), as well as the food safe and environmentally friendly Earthfirst® PLA – Polylactide, or Polylactic acid shrink labels. The Generic ST-100 Steam Tunnel is currently being used in many of the world’s most notable manufacturing plants including several Fortune 500 companies, and has led the way for proper label contour in today’s world of durable shrink sleeves. Prevents bubble marks or scaring of the package. Built to accomodate containers of multiple sizes and shapes. Adjustable nozzles provide the option to redistribute steam when a new container is needed. One (1): Our self contained steam generation process is used to apply decorative sleeves or tamper proof seals to your containers. This machine is built with quality stainless steel over the conveyor design. It features a self contained steam generation system with condensate return. This Steam Tunnel can easily fit into your existing production line or can stand alone. Construction: All stainless steel construction. Steam Tunnel opening is 5″ wide by 12.25″ high and has 4″ exhaust ports to insure evacuation vortex. Conveyor is 6.5″ (166mm) wide by 96″ (2.44m) in length, 34″ to 38″ is standard height with variable speed control. Conveyor shrink station is equipped to handling round, square, oval, tapered, flat and other custom shaped containers in glass or plastic. Features: Steam tunnel system features multiple pass steam channeling and cross zone ported jets for even shrinkage and features a self contained steam generation system with condensate return. Shrink rate is up to 0-200 bpm.